We’d love your help. Let us know what’s wrong with this preview of The Theatre and Its Double by Antonin Artaud. To ask other readers questions about The Theatre and Its Double, please sign up. Artaud faz uma Crítica ao teatro verbal do ocidente que não se utiliza da metafísica dos gestos ,que nunca soube utilizar a música para fins dramáticos ,não faz uso de movimentos ,formas, cores, vibrações, atitudes e gritos. Elogia o teatro oriental que se utiliza de tudo citado acima. Artaud admira o teatro de Bali com toda a sutileza dos gestos , nas modulações variadas das vozes, músicas e mímicas. Critica os diretores ocidentais que seriam eliminadores de atores, enquanto os diretores orient Artaud faz uma Crítica ao teatro verbal do ocidente que não se utiliza da metafísica dos gestos ,que nunca soube utilizar a música para fins dramáticos ,não faz uso de movimentos ,formas, cores, vibrações, atitudes e gritos. Elogia o teatro oriental que se utiliza de tudo citado acima. Artaud admira o teatro de Bali com toda a sutileza dos gestos , nas modulações variadas das vozes, músicas e mímicas. Critica os diretores ocidentais que seriam eliminadores de atores, enquanto os diretores orientais seriam um ordenador mágico, um mestre de cerimônias sagrado. Critica também as adaptações de obras primas a qual chama de teatro psicológico .Essas obras teriam que ser adaptadas para a época atual. I'm practically a phillistine when it comes to fine arts. Even then, I found much of what Artuad's essays in this manifesto to be extraordinarily accessible. The Occidental theatre has lost its magic to make a metaphysics out of gestures, lighting, movements, in the short, the whole mise en scene, proclaims Artuad. The Director prostrates before the Author, the stage before the text, the non-discursive materiality of the word before the written text. Frustrated by the emanciation of Theater into I'm practically a phillistine when it comes to fine arts. Even then, I found much of what Artuad's essays in this manifesto to be extraordinarily accessible. Frustrated by the emanciation of Theater into a pathetic, anaemic screen on which our psychological and moral squabbles are half projected and half resolved, Artuad proposes that we break out of the dictactorship of written text and restore to Theater its original destiny as a spectacle of equal convulsion, impulse, and vigour as the phenomenon of life itself. In the Balinese theater, for example, the distinction between background and foreground collapse under the immense abstract weight of the costumes, the sound of the thunderous musical accompaniments that threaten to become gestures in their own right, and the geometric lines articulated by sudden and mechanical sliding, twisting, and turning of the heads, limbs and wrists. Artuad notoriously fancies "cruelty" as the essential dimension of this Theater. But cruelty is something wholly other than bloodshed, at least according to Artuad. Rather, it is an abstract principle that life insofar as an conscious effort on its own part to discriminate itself from unlife obeys to the nth degree. Namely, life is already cruelty. "Cruelty signifies rigor, implacable intention and decision, irreversible and absolute determination"
Ocjenu sam dao oslanjajući se pretežito na sadržaj, s time da je stil jako kvalitetan. U vezi jezika valja reći da je sve pisano esejističkim stilom koji je, u nekim teorijskim tekstovima, toliko isprepleten s književnoumjetničkim stilom da se neki teorijski tekstovi mogu smatrati i književnim djelima, posebice tekst "Kazalište i kuga". Jezik je jednostavan i razumljiv. Artaud je posjedovao izniman i živopisan duh, iz njegova teksta kreativnost,u stilu i u sadržaju, bombardira čitatelja. Teorijska ideja gotovo potpunog odbacivanja teksta, u potpunosti micanje dijaloga, negiranje europskog psihološkog kazališta je inventivna i avangardna. Meni je tekst uvijek draži od posttesktualnog kazališta, no kužim što Artaud želi. S time da nikada nisam gledao artaudovsku predstavu, možda bi nakon gledanja jedne takve predstave i zavolio takvo kazalište više od ovog srednjostrujaškog kazališta. Artaud je u pravu kada tvrdi da su dijalozi, izgovaranje riječi, konkretni psihološko-egzistencijalni problemi kazališnih likova nekazališni element kazališta. Artaud smatra da je temelj kazališta režija, po uzoru na kazališta nezapadnih društava želi ostvariti kazalište utemeljeno na kretnjama tijela, simbolici scenografije, neljudskim zvukovima, neartikuliranim zvukovima te na novom korištenju rasvjete. Artaud želi dovesti publiku nasred kazališta, da se predstava odvija u svim smjerovima oko publike. Artaud je prometejska vatra, svojevrsni Donadini, rušitelj starog, stvaratelj novog, koji je, poput Donadinija, bio psihički bolestan. Artaud je bio bajronovska ličnost avangarde. Obično, u svojim osvrtima, nikada ne govorim o piscu, no Artuad me zaintrigirao. On je Napoleon književnosti, Raskoljnjikov koji je pokušao ubiti Aljonu Ivanovnu, no gledajući današnje srednjostrujaško kazalište, očito je da je Aljona Ivanovna još živa. Ali nakon Artauda, iako živa, još nije izvadila sjekiru koja joj je zabodena od strane Artuda, te tetura, sve više i više. Pročitavši ovu knjigu očito je da je velik utjecaj na nju imalo Nietzscheovo "Rođenje tragedije". No na kraju smo Kali Yuge, na kraju smo helenističke kulture, bar se možemo nadati, no smrt naše civilizacije je očigledna. Aljona Ivanovna će valjda uskoro preminuti. I just re-read a little of this. After finishing Strip City I wanted something to read while hanging around the house one day but couldn't decide what to start next so I went with a little out of Theatre. It is one of my all time favorite peices of writing. I've picked this book apart so many times that this time I decided just to enjoy the words. Artaud had a way with words that I haven't found anyone else close to. Take for example this paragraph from The Theatre and The Plague (my personal fav I just re-read a little of this. After finishing Strip City I wanted something to read while hanging around the house one day but couldn't decide what to start next so I went with a little out of Theatre. It is one of my all time favorite peices of writing. "A social disaster so far-reaching, an organic disorder so mysterious--this overflow of vices, this total exorcism which presses and impels the soul to its utmost--all indicate the presence of a state which is nevertheless characterized by extreme strength and in which all the powers of nature are freashly discovered at the moment when something essential is going to be accomplished." 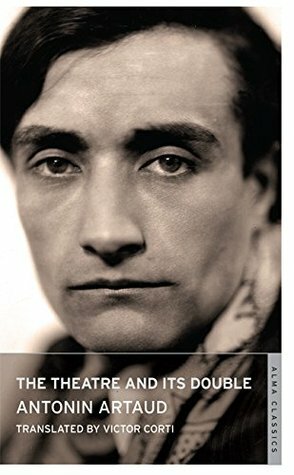 I disagree wholesale with pretty much everything Artaud has to say--and his philosophies usually produce the kind of insufferable pretentious theatre nobody outside of an art school can stand--but this is still essential reading for any serious theatre student. The last chapter on actor-as-athlete Is particularly worthwhile. Following a lengthy discursive diatribe on plagues, Artaud gets to his metaphor: theater is like a plague. Both hit you in the lungs and mind. They each grab and twist, taking over, and whereas the plague will kill you, theater, if done to Artaud’s specifications, captures the breath and liberates the mind. Liberate it from what? Who knows. Artaud thinks of theater as a venue to play out “the perverse possibilities of the mind.” To those who think that’s dark and morbid, Artaud says that’s life’s Following a lengthy discursive diatribe on plagues, Artaud gets to his metaphor: theater is like a plague. Both hit you in the lungs and mind. They each grab and twist, taking over, and whereas the plague will kill you, theater, if done to Artaud’s specifications, captures the breath and liberates the mind. Liberate it from what? Who knows. Artaud uses a painting by Lucas ven den Leyden, “The Daughters of Lot,” to demonstrate his theories of metaphysics and mise en scène in art. He says, “it affects the mind with an almost thunderous visual harmony.” He says the painting contains the following elements, and capitalizes them: Becoming (a transformation of some kind), Fatality (death, it’s coming for all of us, so let’s acknowledge it), Chaos (in the painting, fireballs shoot down from heaven), Marvelous (the non-representational), Equilibrium (what I interpret as balance in aesthetic composition), & Impotence of Speech (talk is cheap). These words become the foundation for his Theatre of Cruelty. He advocates for a poetry of space, “a poetry of the senses,” to leave the “poetry of language” for the page. He questions the notion that the script should be the number one priority of a stage production. Why? Literature is for an audience of one. The writer isn’t present, so all a writer has are words. Conversely, theater is present, and when one is in the same room as the audience, what you control above all else is atmosphere, mise en scène. How to do that? Target multiple sensory registers and shoot. If you’re going to use words at all, weird them, make them loud, soft, chant them, fragment them. Do anything but use words in actors’ mouths to achieve some “modern humanistic and psychological meaning,” some blah blah realistic domestic drama, a prestige play that tries to represent real life. Where is the danger in that? Artaud does not want his audience to quaintly empathize with a character, to see themselves. He wants to yank out their insides and hold the bleeding organs in front of their eyes. It took me longer than expected to finish this book. A collection of essays on modern techniques that should be introduced to theatre, and how theatre shouldn't be a mere performance based on a written text. Many interesting elements but a lot of redundancy that made me lose focus several times. Newer Review: Apparently the first time I read this I rather enjoyed it, but this time I was really put off by the racism, especially in essays like "The Balinese Theatre." But I also disliked this essay because I simply have no idea what he's talking about. I mean, I have a sense of how Balinese performance works and what it generally looks like, but Artaud's explanation of it is so bizarre and dependent on generalizations about a shared communal response that his explanation simply doesn't mak Newer Review: Apparently the first time I read this I rather enjoyed it, but this time I was really put off by the racism, especially in essays like "The Balinese Theatre." But I also disliked this essay because I simply have no idea what he's talking about. I mean, I have a sense of how Balinese performance works and what it generally looks like, but Artaud's explanation of it is so bizarre and dependent on generalizations about a shared communal response that his explanation simply doesn't make sense to me. I think I have some sense of what his overall goal is--a theatre of expression almost without words, where other non-linguistic semiotic codes do the work of meaning making, but I simply don't see how that kind of theatre is meant to consider deep metaphysical issues as he says it does/will/should (though maybe I misunderstand what Artaud means by 'metaphysical,' which could significantly change my reading of his theory). The other thing I don't fully understand with Artaud is why. I mean, Brecht lays out fairly clearly why he wants the Epic/Dialectic Theatre, but I don't really see much justification for Artaud's Theatre of Cruelty. Yes, he points out that there is some kind of problem with contemporary theatre (of the 1930s), which I think was a fairly well accepted idea, but apart from a general primitivist ethic in Modernism I don't see anyplace where he explains why the Theatre of Cruelty is THE way to redeem theatre. Original Review: I was intiially put off by several aspects of Artaud's theory--his notable racism (he has overly romantic of non-Wester ultures), the vagueness of his terms (especially "life," just as in Nietzsche), and his general inability to clearly articulate what exactly he wants. By the end of the book, I still feel that these are problems, but they bother me much less than after the first two or three essays. The racism is very much a problem of its time, and for the 1930s a noble-savage mindset was somewhat tolerant. The vagueness never really goes away, but as he repeatedly tries to explain and develop his core idea, this vagueness becomes less and less problematic. Whether you study the theater professionally or are just interested in learning something new about it, you’ll enjoy this book thoroughly. Not all of Artaud’s positions are acceptable for me. For example, I do not agree that the Oriental theater is superior and more invocative just because it is about the spiritual conflicts. The Occidental (Western) theater, the theater of psychological conflicts based on spoken language, could acquire the same incantation, depending of actors’ professionalism Whether you study the theater professionally or are just interested in learning something new about it, you’ll enjoy this book thoroughly. Not all of Artaud’s positions are acceptable for me. For example, I do not agree that the Oriental theater is superior and more invocative just because it is about the spiritual conflicts. The Occidental (Western) theater, the theater of psychological conflicts based on spoken language, could acquire the same incantation, depending of actors’ professionalism and directors’ skillfulness. Nevertheless, thanks to Artaud I discovered the theater of cruelty, the surrealistic theater, I did not know anything about before, being just a theater lover and not a specialist. As for me, the general ideas of the theater of cruelty would be better understood if one ever watched the works of Mnochkine’s “Theatre du Soleil”, Punchdrunk’s immersive “Sleep no more” or pantomimic “Mummenchantz,” presenting the art of performing in different means, but alike in surrealistic approach, brought to life by Artaud’s generation. I highly recommend to paire at least one of the above pieces with the “Theater and its double” in order to value the ideas of Artaud as well as their impact on the theater in general. this book should be read, closely read, re-read, and taken seriously by anyone who ever takes theatre seriously as an artform, a means of communication, a way of life, or the only thing we've ever done besides procreating, defecating, and dying. it's written by a total lunatic who's thoughts and precision cannot be dismissed because of his insanity. to the contrary, his particular mental disturbances so sharpen his thoughts, that, at the very least, they need be considered, if not pored over with this book should be read, closely read, re-read, and taken seriously by anyone who ever takes theatre seriously as an artform, a means of communication, a way of life, or the only thing we've ever done besides procreating, defecating, and dying. it's written by a total lunatic who's thoughts and precision cannot be dismissed because of his insanity. to the contrary, his particular mental disturbances so sharpen his thoughts, that, at the very least, they need be considered, if not pored over with great care. as with many of our madmen, artaud was directionally crazy, and his direction took him through the heart of theatre. the fantastic thing about this book, for anyone working in theatre, is that it gives you the answer to the question: what would i think about what i'm doing here if i were so batshit crazy that i could think about nothing else? Artaud argues that theater has become subordinate to the text and that the mise en scene and spectacle need to be privileged in his revolutionary call for a theater of cruelty. He calls for a new language, not one of words, but one of signs in which words are still used, but not solely for their grammatical meanings; words instead should be chosen for their sonority and vibrational qualities. I was alternately fascinated by Artaud's vision and suspicious that it's possible (Conclusion: it's poss Artaud argues that theater has become subordinate to the text and that the mise en scene and spectacle need to be privileged in his revolutionary call for a theater of cruelty. He calls for a new language, not one of words, but one of signs in which words are still used, but not solely for their grammatical meanings; words instead should be chosen for their sonority and vibrational qualities. This book is to the theatre as Alfie Kohn's "Unconditional Parenting" is to parenting. So many of the sacred Myths keeping the theatre from its potential exist today as much as they did when Artaud and Brecht were writing. This is a masterpiece; essential to a reading list for any first year theatre student. "In the true theater a play disturbs the sense's repose, frees the repressed unconscious, incites a kind of virtual revolt (which moreover can have its full effect only if it remains virtual) This book is to the theatre as Alfie Kohn's "Unconditional Parenting" is to parenting. So many of the sacred Myths keeping the theatre from its potential exist today as much as they did when Artaud and Brecht were writing. This is a masterpiece; essential to a reading list for any first year theatre student. This is a very dangerous book. PERILOUS. I am going to re-read it at once. Artaud era de fato um louco reacionário, mas o seu estilo de escrita e argumentação são ótimos. Muitas de suas ideias continuam válidas, mesmo com o radicalismo que incutiam. Not an easy read, but an authentic one. Artaud es para releer, ya que al leerlo te pierdes en sus detalles, adjetivos y formulaciones. Es una visión importante entre los dos tipos de teatro fundamental y cómo se articula la mirada en ambas. Trata sobre una crueldad, un poco metafísica, que pretende destacar la importancia de no ser la escena la que cede ante el texto, sino al contrario. Busca un teatro que se mueva desde la piel. Me ha gustado, pero no es un libro fácil. If our lives lack fire and fervour, that is to say continual magic, this is because we choose to observe our actions, losing ourselves in meditation on their imagined form, instead of being motivated by them. This took me seven months to get through, but that excerpt unpacked everything for me. Me equivoqué con este libro en mi primera valoración. Es lo que tiene el turbocapitalismo: vivimos con tantas prisas que no solemos tener tiempo para releer, para revisar, para reescuchar; formándonos muchas veces, como consecuencia, opiniones muy superficiales de las cosas. Het theater in het Westen van deze tijd (jaren dertig van de vorige eeuw) legt te veel de nadruk op het geschreven woord (en dit om meestal thema's van psychologische aard te behandelen), waarbij de regisseur van het toneelstuk onderdanig is aan de tekst van de auteur. Het theater moet echter een Gesamtkunstwerk (mààr géén spektakeltheater; zie hieronder) zijn; een aanval van op alle vlakken en dit op alle zintuigen van de toeschouwers met inbegrip van het onderbewuste en de ziel. De toneelacteu Het theater in het Westen van deze tijd (jaren dertig van de vorige eeuw) legt te veel de nadruk op het geschreven woord (en dit om meestal thema's van psychologische aard te behandelen), waarbij de regisseur van het toneelstuk onderdanig is aan de tekst van de auteur. Het theater moet echter een Gesamtkunstwerk (mààr géén spektakeltheater; zie hieronder) zijn; een aanval van op alle vlakken en dit op alle zintuigen van de toeschouwers met inbegrip van het onderbewuste en de ziel. De toneelacteur zijn acteerspel, zijn elke beweging, zijn elk al dan niet geuit woord, moet worden gedicteerd door zijn of Dé Ziel ('le double' zoals Artaud het bedoelde in zijn oorspronkelijk in het Frans geschreven "Le théâtre et son double", in 1938 voor de eerste maal verschenen bij Gallimard.)! Men moet hiervoor gebruik maken van de Oude Mythologieën, de gebruiken en ideëen van de Azteken en meerbepaald Montezuma de illustere koning, en nog meerbepaald moet men de mosterd halen bij het Balinese Theater, dat vooral geaccentueerd wordt niet zozeer door de taal van het woord, mààr door de taal van de beweging, de klank, de muziek en het licht... Zo ook moet ons toneel zijn, zegt de in zijn leven vaak door psychische problemen en daardoor in de instellingen van zijn tijd verblijvende toneelschrijver, regisseur, poëet, acteur, tekenaar en essayist Antonin Artaud het in dit werk. Dat werk werd door mij maandenlang (met lange tussenpozen waarin het op mij lag te wachten op de koffietafel) met mondjesmaat opgenomen. De tekst is complex en moet dat voor anderstaligen in het Frans bijna onmogelijk te lezen maken. In het begin ontcijferde ik paragraaf na paragraaf, bijna echt werd door mij deze tekst waargenomen als voortgekomen uit de koker van een totaal geschifte mens, maar wat dus in realiteit een genie was. Na iet of wat vorderen wordt het boek veel en veel toegankelijker en vlotter leesbaar. Het is een tektst met een puur poëtische inslag. Het werd in zijn tijd zelf door verschillende tijdschriften geweigerd. Maar we mogen blij zijn, om een cliché te gebruiken, dat de in het algemeen gezien interessante Uitgeverij Ijzer (me voorheen volkomen onbekend) uit Utrecht, dit werk, in een let op, vertaling van de ook wel spiritueel ingestelde dichter en nog niet zo lang geleden overleden man Simon Vinkenoog, op de markt heeft gebracht. Een van de vele treffende zinnen uit het boek is de volgende:"Een toneelacteur is een atleet van het hart." Dat lees ik dan, die op zich niet zo veel met het theater van doen heeft maar eerder plastisch aangelegd is bv., als volgt:"De kunstenaar is een atleet van het hart." Ik denk dus dat het boek niet alleen verplichte lectuur is voor de acteerstudenten van het gerenommeerde instituut Herman Teirlinck, maar voor alle creatief ingestelde mensen. Niet verplicht, maar wel een aanrader. Ook gewoon als breinbrekertje te bekijken om de hersenen eens te laten kraken en fris te houden. - en zo rechtstreeks bij de Ijzermannen de boeken bestellen. .Het theater van de wreedheid is een verzameling lezingen, opstellen, manifesten en brieven, ontstaan vanaf 1931 en verscheen in 1938 onder de titel Le théatre et son double. Hierin ontwerpt de regisseur, toneelspeler, toneeltheoreticus, dichter en tekenaar Artaud een provocerend, revolutionair theaterconcept; hij wijst het westerse, psychologiserende taaltheater af en verlangt, onder de indruk van het Oost-Aziatische toneel, een hele revisie van de westerse voorstelling over het leven en de zin ervan. Het theater krijgt daarbij een wezenlijke, magisch-religieuze rol toebedeeld: het moet de mythe van de moderne mens en het moderne leven, die in de ziel van het individu en het collectief latent aanwezig zijn, in een extreme, aangrijpende vorm op toneel brengen. In de plaats van de literaire taal komt de taal van beeld en beweging, die zich verbinden tot een nieuwe theatertaal die de toeschouwer verontrust en tot een identificatie met het toneelgebeuren dwingt. Antonin Artaud (1896-1948) wordt beschouwd als de belangrijkste (theoretische) voorloper van veel moderne stromingen in toneel, schrijven, film en muziek die uit de huidige praktijk nauwelijks meer weg te denken zijn. Het door hem gepropageerde ‘theater van de wreedheid’ ligt op veler lippen, hoewel het herhaaldelijk verkeerd werd begrepen en voorgesteld als een soort spektakeltheater. Daarnaast gaat er van Artauds fascinerende persoonlijkheid zo’n uitstraling uit dat de belangstelling voor deze gekwelde geest en zijn werk blijft groeien. Teatrul cruzimii definit ca fiind "afirmarea/unei teribile/ și de altfel ineluctabile necesități"
Fascinating, critical, turbulent, insightful. Provides invaluable perspective and criticism for literary artists. "Teatro de la crueldad significa teatro difícil y cruel ante todo para mí mismo"
quickly skimmed through this for my theatre project. very interesting ideas! Considered among the most influential figures in the evolution of modern drama theory, Antonin Artaud associated himself with Surrealist writers, artists, and experimental theater groups in Paris during the 1920s. When political differences resulted in his break from th Antoine Marie Joseph Artaud, better known as Antonin Artaud, was a French playwright, poet, essayist, actor, and theatre director. When political differences resulted in his break from the Surrealists, he founded the Theatre Alfred Jarry with Roger Vitrac and Robert Aron. Together they hoped to create a forum for works that would radically change French theatre. Artaud, especially, expressed disdain for Western theatre of the day, panning the ordered plot and scripted language his contemporaries typically employed to convey ideas, and he recorded his ideas in such works as Le Theatre de la cruaute and The Theatre and Its Double. Artaud believed that theatre should represent reality and, therefore, affect the audience as much as possible, therefore he used a mixture of strange and disturbing forms of lighting, sound, and other performance elements. Artaud wanted to put the audience in the middle of the 'spectacle' (his term for the play), so they would be 'engulfed and physically affected by it'. He referred to this layout as being like a 'vortex' - a constantly shifting shape - 'to be trapped and powerless'.